The City of Ridgeland is dedicated to minimizing the loss of life and property that is associated with flooding events. Education and prevention are valuable and proven tools that help communities become resistant to these natural disasters. The City of Ridgeland recognizes that its entire community is susceptible to flooding, not just those structures located within the Special Flood Hazard Areas (SFHA’s). The following information is being provided to help inform all property owners within the City of Ridgeland of the dangers of floods and how you can help protect yourself. Culley-Brashear Creek, School Creek, Beaver Creek, Purple Creek, White Oak Creek, and LaRue Creek are the six major sources of flooding within the city limits of Ridgeland. Each creek is subject to overtopping its banks during heavy storms. The worst area of flooding is along Culley-Brashear creek. Other low-lying areas around Ridgeland are prone to flash flooding. To find out if your property is subject to flooding, call the Public Works Department at 601-853-2027. TURN AROUND DON’T DROWN! Do Not Walk Through Flowing Water. Drowning is the number one cause of flood deaths, most during flash floods. Currents can be deceptive; 6 inches of moving water can knock you off your feet. If you walk in standing water, use a pole or stick to ensure that the currents have not washed away the ground on which you are about to step. TURN AROUND DON’T DROWN! Do Not Drive Through A Flooded Area. More people drown in their cars than anywhere else. Don’t drive around road barriers; the road or bridge may be washed out. Stay away from power lines and electrical wires. Electrocution is the number two cause of flood deaths. Report downed power lines to the Power Company or call 911. Turn off all electrical circuits and gas lines that may come in contact with flood water. Flood insurance is not covered by normal homeowners insurance. Anyone can purchase flood insurance. Flood insurance is required by law in order to obtain a federally secured loan to buy, build or renovate a structure located in the FEMA Special Flood Hazard Area (SFHA). Don’t wait for the next flood to buy flood insurance. There is a 30-day waiting period before the coverage is effective. Contact your local insurance agent for more information on rates and coverage. You can also visit www.fema.gov/nfip . Keeping debris and trash off the tops of drain inlets and out of streams and ditches is a must for flood prevention. Contact the Public Works Department at 601-853-2027 to discuss ways to help eliminate or minimize flood damage. 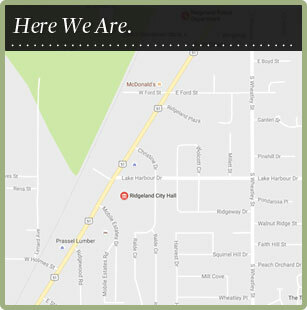 All development in the City of Ridgeland is required to have local and state permits. Contact the City of Ridgeland’s Community Development Department at 601-856-3877 for advice before you build, fill, place a manufactured home, or otherwise develop. The zoning ordinance, flood damage prevention ordinance, and the International Building Codes have special provisions regulating construction and development in the floodplain. Any development in a floodplain without a permit is illegal and should be reported to the Director of Community Development at 601- 856-3877. In 1979, the City of Ridgeland joined the National Flood Insurance Program (NFIP). The City’s Flood Damage Prevention Ordinance requires that all buildings constructed after this date must be elevated to a minimum of 18” above the Base Flood Elevation (BFE). Pre-FIRM buildings, those built before September 28, 1979, must be elevated, if damaged by any cause, for which the repair costs are 50 percent or more of the value of the building. Likewise, if you want to remodel, add an addition, or in any way improve the structure for which the total cost will be 50 percent or more of the value of the building, it must also be elevated. This means that the existing building and any additions or improvements, including mechanical and electrical equipment, must have its finished floor elevated to at least 18” above the BFE. The “total cost” means all structural cost, as well as all finished materials, built-in appliances, hardware, in addition to profit and overhead. The value of a building is the market value of the structure only. The market value of a building is determined by obtaining an appraisal from a Mississippi licensed appraiser. The Madison County Tax Assessor records may be used as well. Any alterations to your building requires a permit from the Community Development Department. It is a violation of the City of Ridgeland’s Ordinance 900013 to dump any type of debris, including grass clippings, leaves and branches into storm sewers, ditches, and streams. This debris will accumulate and plug culverts, shallow stream beds, or drainage ditches. Plugged culverts, streams, and ditches cannot carry water. Therefore, when it rains and the water has nowhere to go, it floods the streets and yards. Citizens of Ridgeland can do their part by not dumping trash and debris in creeks and ditches and by not blowing grass and leaves into the storm sewers. Remember, every piece of trash and litter contributes to your flooding. If you see anyone dumping or throwing debris in the ditches, streams, or storm sewers, please report it to the City of Ridgeland’s Public Works Department at City Hall or by calling 601-853-2027. To find out if your property is located in a Special Flood Hazard Area (SFHA), you may call, visit, or email the Public Works Department located in City Hall at 304 Highway 51. You may also view the FEMA Flood Insurance Rate Map (FIRM) by clicking here. If you are located in a high risk area, the Public Works Department will provide you with the following FIRM and Floodway information: community number, map panel number and suffix, effective date of FIRM, the flood zone, base flood elevation (BFE) where shown, and the elevation datum used on the FIRM. You will also be informed of the mandatory purchase of flood insurance. If your house is in the SFHA, you will need to hire a licensed professional surveyor in the state of Mississippi to provide you with an elevation certificate. This certificate is site specific and gives the 100-year base flood elevation, and the elevation of the house’s lowest floor. The City maintains copies of Pre-FIRM (structure built before September 28, 1979) and Post-FIRM elevation certificates. To view the certificates on file, click here. Real time river gage information can be obtained through the following websites: http://waterdata.usgs.gov or through www.usgs.gov. Concerned residents may contact the Public Works department at 601-853-2027 to request flood protection assistance with flooding, drainage, and/or sewer issues. A representative of the department will visit the site and provide one-on-one advice to the property owner with ways to stop flooding or prevent flood damage. They can also provide you with information about historical flooding in the neighborhoods.